In December 2010, UFA assurances launched a 3D mapping competition. The challenge is to come up with a concept and a 2 minute animation to be screened on the UFA building in downtown Beirut, in three weeks. After being constructed, a building is viewed as an object that would blend into its surroundings. At the stage of its design, many factors come in to direct its articulation and volume so as the resulting product would respect the urban setting in which it will belong. With this, the building is no longer differentiated within the cityscape and cannot be perceived with the absence of any of those structures. However, what has been registered as cityscape is nothing but a contour of those buildings. Therefore, the building loses its essence and becomes a mere object in a concrete jungle. The UFA building is directly stuck unto the Le Grey building, and separated by a few meters from the Virgin building. The building lies between two prominent structures that somehow overshadow its presence by the use of similar stone finish that makes them all blend into a certain urban context dictated by the urban planning. Therefore, our goal is to highlight the architectural lines and details of the building so as to make it visible onto the people. We plan on turning the attention of the public onto its features by focusing on the elements that are used to make up the main façade overlooking Martyrs’ Square. This will be done by making the building appear and disappear within a certain background. Different images will be used to create the building’s surface. To make it reappear we will focus on the lines that determine the building and recreate its surface by accentuating the shadows and retracing it. 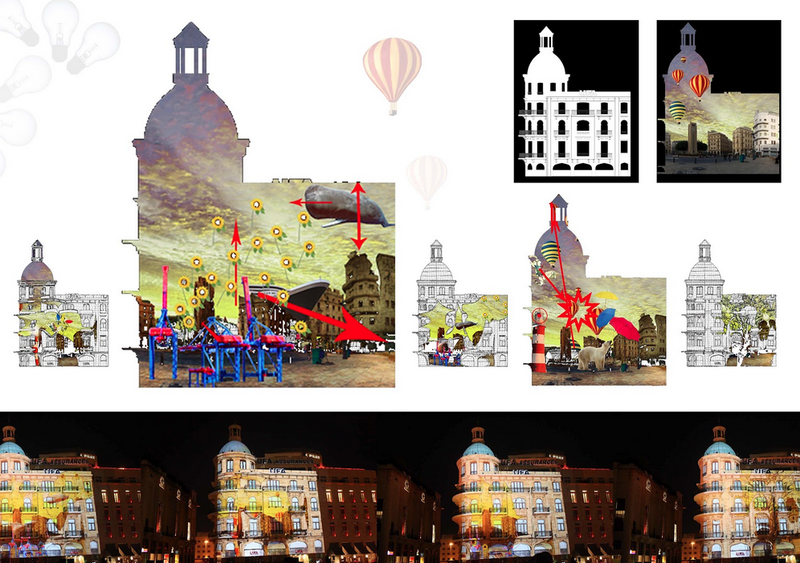 The recreation of the building’s façade will be achieved by the animation of all these different elements.